Gamasutra: Richard Atlas's Blog - How Does the Future of the Streamer-Developer Relationship Look? How Does the Future of the Streamer-Developer Relationship Look? In our sprint meeting this past week, the question of paying streamers to play our game on Twitch and YouTube came up. It let to a longer discussion and brought up some important questions that I’d like to bring up here, and without trying to reach a conclusion, make people aware of the things we have to consider for the future. The conversation centered around the idea that we want some streamers to play our new update to our game Ultimate Chicken Horse a few days before the release, so that we can build some hype around the launch of the new content. How should we approach these streamers? Do we pay them directly? Do we go through something like the Twitch Bounty? Do we simply offer them the exclusive early content and hope they play it without compensation? There isn’t necessarily a clear answer for this question, so I’ll try to formulate some thoughts here. 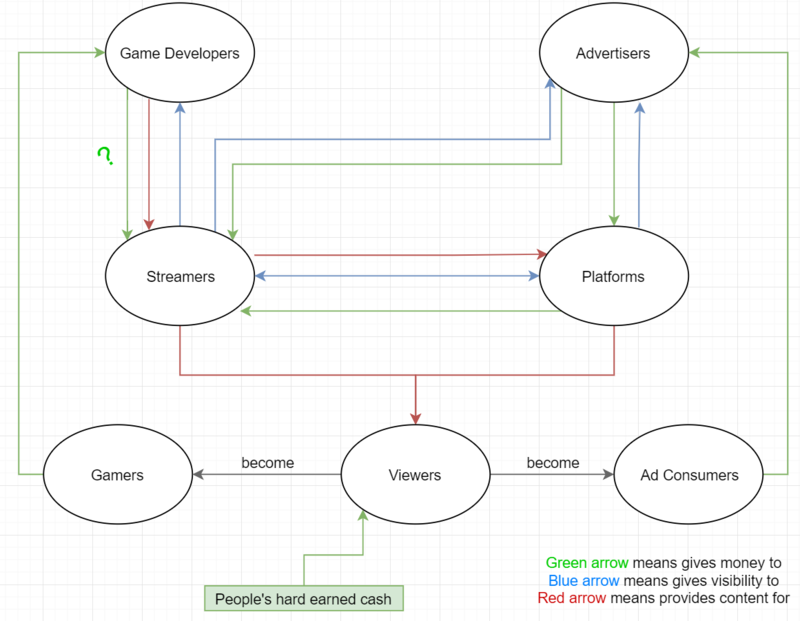 So here’s what I think the current situation looks like, and the green arrow with the ‘?‘ is what my team discussed in our meeting. If you look at the relationship between any two groups mentioned here, it should make sense; for example, platforms receive money from advertisers, and advertisers get visibility in exchange. Advertisers also pay streamers directly and get visibility directly through them. The cash comes back to them from viewers of the content which become ad consumers when they buy the products being advertised to them. The relationship between the streamer and the developer is the more complicated one here. The developer creates games that the streamer can use to create content for their viewers, and content for the platforms to show to their viewers. In return, the game developers get visibility from the streamers (because of their viewers). The question we were discussing seems to be whether or not the creation of the game is enough to justify the visibility being given to the developer, or if there should be money involved that comes from the developer and not only from the advertisers (either directly or through the platform). So if we look only at the money flow, it gets injected into the system by people who are engaging with the system, presumably funded by their jobs. The cash comes to the developers when the viewers are convinced to buy the game and become gamers. The cash goes to the advertisers when people become ad consumers. The cycle can continue because the developers, streamers, platforms, and advertisers are making money and the gamers and viewers are happily spending it. Should developers be paying streamers directly for the exposure they give to the game? What kind of precedent do we set for this interaction, in either case (developers paying streamers or not paying them)? Who “owes” who more, between devs and streamers? That is, a huge influencer playing a small game is much more advantageous for the dev than the streamer, but a huge game being created and given for free to a tiny streamer is more advantageous to the streamer. Where’s the tipping point? Does it matter? If developers are paying streamers, how do we decide the basis for the payment? Time? Viewers? Engagement? Actual game purchases? How do we open the communication between developers and streamers without going through platforms to discuss these things? What do we think is fair to all parties (including advertisers and platforms)? How much should the advertiser money (ad revenue) be going to the streamer as opposed to the platform? Another thing that came up, for better or for worse, was the idea that indie game studios sometimes ride on the big marketing budgets of the AAA companies in terms of streamers getting compensated. If a streamer makes $30k for playing a new Ubisoft game, they won’t bother asking a small indie for $200 for the same amount of time in their game (for many reasons). If the decision is that developers should pay streamers for the visibility they provide, is it fair to ride on the back of these huge studios? I realize that this post is asking a lot more questions than it’s answering, but that’s kind of the point. We don’t know what the future of this relationship will look like just yet, but it’s going to be us (developers) alongside streamers who will need to figure it out. We all want what’s best for all parties, and we want to be fair to all parties above all else.